Reaching for the stars and plunge into the fancy and colorful world of fruit cubes! 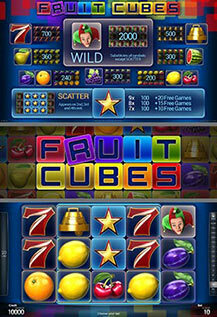 These 20 lines and 5 reels are filled with stacked symbols and deliciously fruity prizes. WILD substitutes for all symbols except SCATTER. 7 or more scattered STAR symbols trigger up to 25 free games (15 for 7 SCATTERs, 20 for 8 SCATTERs and 25 for 9 SCATTERs). Free games are played at current bet.